Despite technological advancements, most secondary schools still function on ideas that are more than 100 years old. Learning Without Classrooms outlines new guidelines for how schools must operate to remain relevant and effective as we move further into the 21st century. Making a persuasive argument for moving beyond the long-established idea of operating schools with traditional classroom instruction to a personalized learning environment for individual students, the authors detail six crucial elements of school management (community, instruction, time, technology, school facilities, and funding) and how to address them concurrently to improve secondary school learning environments. Learn the six elements of schooling, and understand how changing any one element influences the others. Explore nine critical skills students need for success in the modern world. Review the structure and methodology behind an advisory-based concept for school management. Consider scenarios of what learning will look like in the near future as powerful new technological tools become available. Study seven visionary designs for how to renovate existing secondary school facilities to support technologically infused, personalized learning environments. "Frank Kelly and Ted McCain take us on a wonderful journey to a place where we can properly engage our future leaders (students) in authentic, meaningful learning. They embrace the technological advantages of information access and creation within a structure that features teachers as advisors. Without being prescriptive, they provide us with a path to some wonderful answers." "In our work to transform education, we often look for the answer to the question: What if we dare to move beyond mediocrity in our secondary schools? Frank Kelly and Ted McCain know how to stimulate the thinking of educators and other stakeholders. 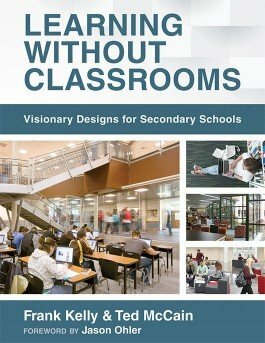 Their message will take you into new and promising possibilities for designing schools in the 21st century that will change your thinking of what secondary schools can and should be." "Learning Without Classrooms allowed me, as an educator, to see a holistic vision of how communities can design schools in a way that revolves around our society's most valuable resource—students. Education can no longer sustain our society with a one-size-fits-all model of pedagogy; rather, education needs to intentionally evolve in a way that fully prepares students to thrive in our ever-changing, modern, global civilization." "With many examples and illustrations, Learning Without Classrooms is both a comprehensive and practical how-to guide for educational planners and a pedagogy guide for educators. This masterful book explores school redesign models to achieve improved student and teacher interaction and explores the teaching practices necessary to support an advisory-based learning model that meets the needs of modern learners. This book is an invaluable resource."